PLEASE NOTE: If you have any problem with the produce, just let us know, we will try our best to solve it for you until you are satisfied! Multifarious Pattern: If you don't like my looking, I have so many sisters and brothers, you just search "FENNEN travel school backpack", you would find your love finally. Personalized design: The cute unique pattern really makes you stands out from the crowd. Just as a gift give your best friends, they would like it very much. Our big family are focus on cute high quality produce(handbags, wallet, certains, backpack, luggage tag, passport holder, pencil case, vacuum cup, shoulder tote and so on.) If you want to find the produce, JUST search "FENNEN +Product Name".Our sole aim is to produce quality goods at an affordable price and make our customer a happy shopping. 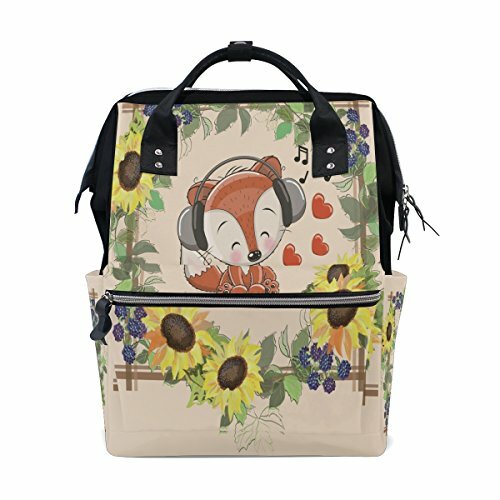 Material: Made of high quality durable waterproof canvas, easy to wipe, with two-way zipper in main bag makes the bag easier to use. Padded back panel and shoulder strap make the backpack easy to carry. Structure: One Large capacity bag, two side pockets, one front zipper pocket, 8 small pockets inside, empty bags can stand. the large capacity and powerful backpack is a good companion for you. Size: 11x7x15.7 inches（LxWxH）. Roomy enough for holding items you want to carry for school, hiking, travelling and so on. Multifunctional: This bag can be used as travel bag, school backpack, casual daypack, clothing gathering, baby diaper backpack for dad or mum. Our Promise: We know you'll love our products as much as we do. However, if for any reason you are not happy with your shopping, please contact us and we'll do our best to solve your problem. Wish you a happy shopping day. If you have any questions about this product by FENNEN, contact us by completing and submitting the form below. If you are looking for a specif part number, please include it with your message.